Study identifies new pathway in insulin resistance. About 8% of Americans have type 2 diabetes, and another 25% of the population is at risk because of obesity. Type 2 diabetes is a lifelong disease that represents an enormous public health burden, accounting for as much as 20% of all healthcare costs in the US. A significant proportion of those costs result from complications of diabetes, including damage to the kidneys, peripheral nerves, and retinas. Now, a study from researchers at the Sanford Burnham Prebys Medical Discovery Institute shows that the protein MondoA controls myocyte lipid balance and insulin signaling. The team state that their findings suggest this pathway may have potential as a therapeutic target for insulin resistance and lipotoxicity. The opensource study is published in the Journal of Clinical Investigation. Previous studies show that the precursor to type 2 diabetes is insulin resistance, in which insulin no longer causes the body’s cells to take up the glucose from a meal and use it for energy. This leads to diabetes because glucose continues to circulate in the blood, stimulating the pancreas to make more and more insulin, which eventually becomes so taxing that the insulin-producing cells die. Earlier studies from the lab focused on skeletal muscle because it’s the main insulin-responsive tissue in the body. An early marker of insulin resistance is the accumulation of fat in muscle, along with decreased import of glucose, therefore, the group examined whether these two processes are linked. To find a protein that regulates both, they screened thousands of molecules for their ability to block fat synthesis and enhance glucose uptake in muscle cells. Investigating the cellular effects of SBI-477, the best hit molecule from their screen, led the researchers to a protein called MondoA. 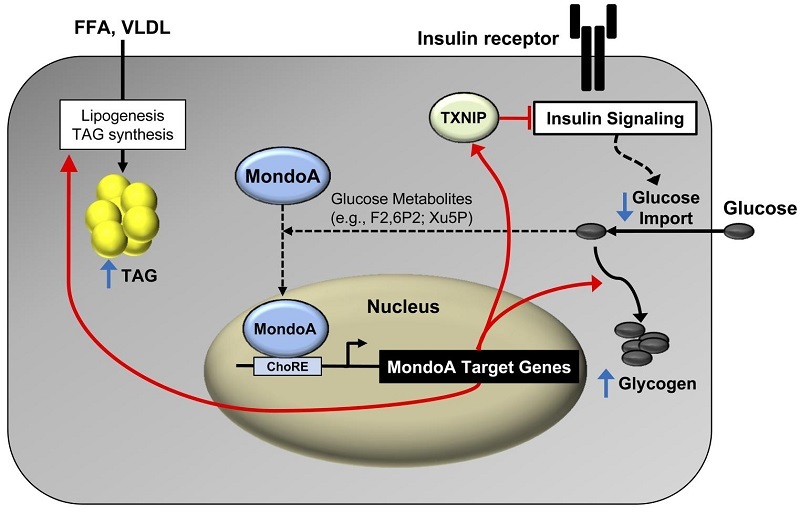 The current study shows that MondoA may serve as a key link between insulin resistance and accumulation of fat in muscle, which occurs in obesity-related diabetes. The current study shows that this protein regulates genes involved in synthesizing fats as well as inhibiting insulin signaling. The team state that this could explain why people who are insulin resistant accumulate fat in their muscle. Results show that MondoA is one mechanism that ties these phenomena together, serving as a gatekeeper for fuel burning in muscle. Data findings show that SBI-477 also enhances glucose uptake in liver cells, suggesting that a MondoA blocker may have this effect on multiple tissues. Results show that SBI-477 mitigates insulin resistance in mice fed a high-fat diet. The lab state that, to their knowledge, this study is the first step towards testing MondoA-targeted drugs to prevent type 2 diabetes in pre-clinical studies. The team surmise that their findings suggest MondoA normally responds to an oversupply of glucose by inhibiting transport of glucose into cells and enhancing its conversion to fat, with persistent activation promoting insulin resistance. For the future, the researchers state that they next plan to develop better molecules that inhibit MondoA. MondoA directs myocyte fuel homeostatic checkpoint functions. Proposed gene-regulatory (red arrows) and metabolic “checkpoint” responses (blue arrows) downstream of MondoA. MondoA is a glucose “sensor” that is directly activated by glycolytic metabolites that stimulate nuclear import of MondoA. Once activated, MondoA functions as a “brake” to limit carbon entry into the cell via increasing levels of TXNIP, an inhibitor of insulin signaling and glucose uptake. In addition, MondoA promotes energy storage through activation of enzymes involved in lipid and glycogen synthesis. Thus, MondoA may serve to limit carbon intake and fuel burning during conditions of “plenty.” However, in states of chronic nutrient excess, persistent activation of MondoA may become maladaptive, contributing to a vicious cycle of cellular lipid accumulation (TAG synthesis) and insulin resistance (TXNIP-mediated suppressive effects). MondoA coordinately regulates skeletal myocyte lipid homeostasis and insulin signaling. Kelly et al 2016.